As usual-nothing less than pure perfection! great figure,by thr way,love the colors and the posing! Thank you so much Liora. Mr Ooobop! is responsible for the clever photography, I can assure you! A fabulous blouse that looks fabulous on you (great outfit!). I love the added interest of the heart buttons, and it’s extra sweet that they were a present from your daughter. So lovely! Thank you for your lovely comment. It was a lovely present and I’m so pleased they got used so soon. Oh WOW. This is just such a blouse of win!!! You look so gorgeous and happy in it too, it’s a perfect make!! Thanks MrsC. It does indeed make me feel very happy! That blouse is fabulous. 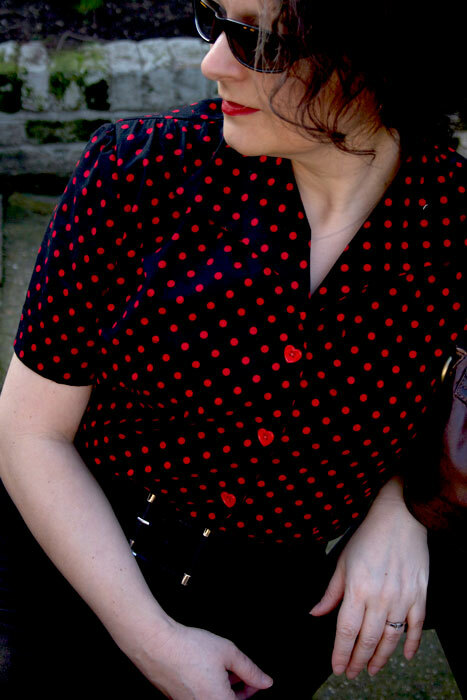 I absolutely love polkadots and those buttons . . . nuff said. You are just too cute!!! 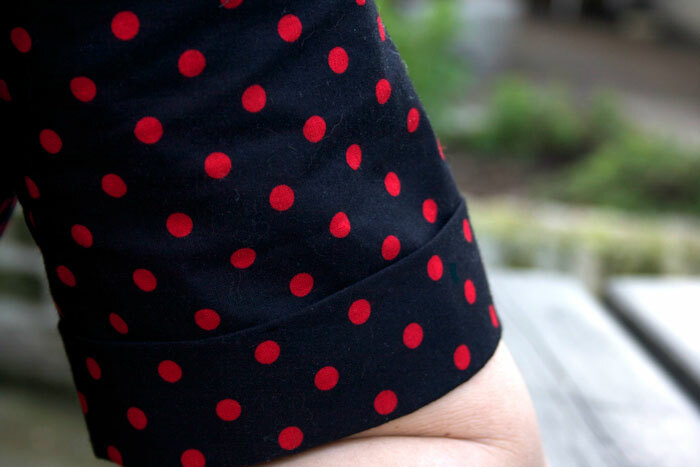 This blouse is adorable on you. Love all the special details you added like the buttons and the red binding. 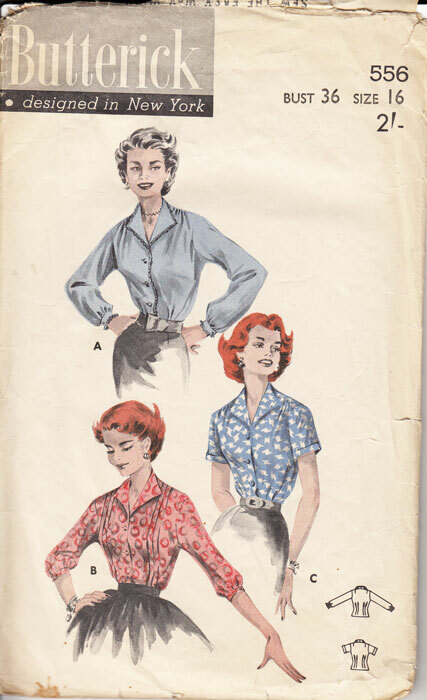 You are inspiring me to do some more pattern sewing soon. I’m heading for Seattle for the week so there will be no sewing going on around here for awhile 🙁 But perhaps I’ll get to some new fabric shops while I’m there 🙂 Have a good week! 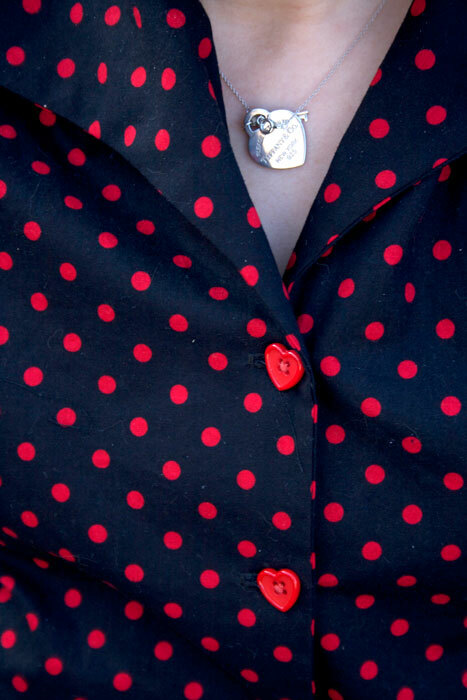 Mmmm I agree, this blouse is perfect – I love everything about it. 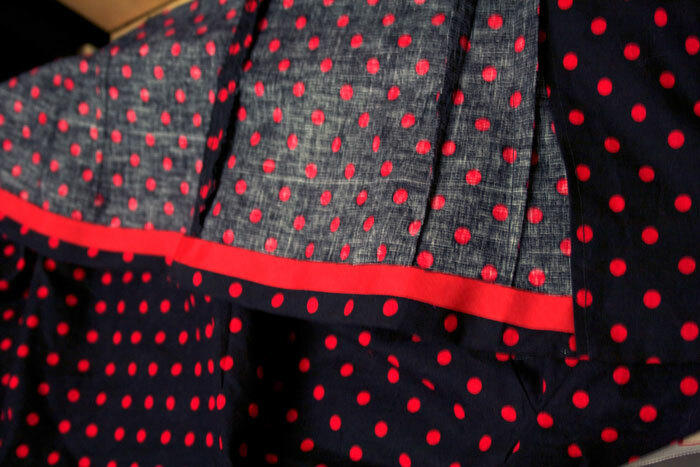 One, yes it’s totally 50’s, two its polka dots, three its red and black, four it has heart shaped buttons. Can you do me one in a size 16 please? Super glamorous! It’s so you. That’s lovely! Brilliant combination of pattern and fabric, you look great! 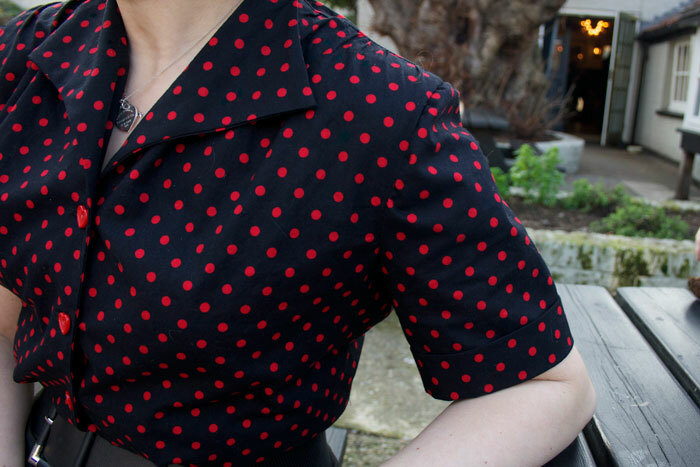 Oh my, I love this blouse so much! 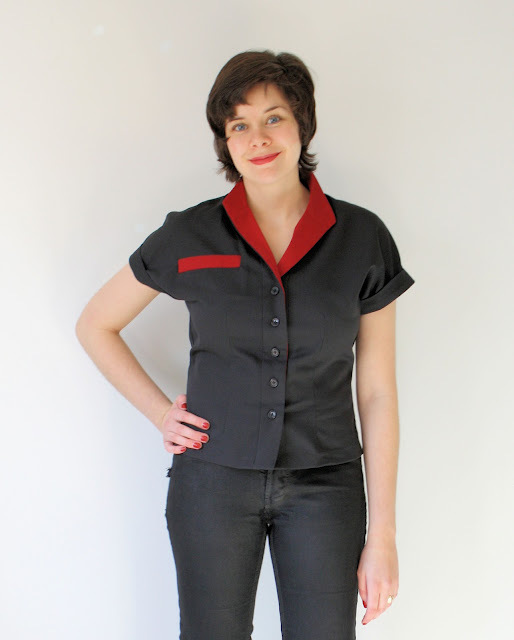 It’s so flattering, the fabric is gorgeous and the buttons are adorable! One of the sweetest blouses I’ve seen in a while!!! I have to admit after discovering your blog a few days ago, I’m ptetry much addicted. Not gonna mention how many of your back entries or interviews I’ve read… hahaLOVE your style. It’s very similar to the style here in Japan! Oh my!! 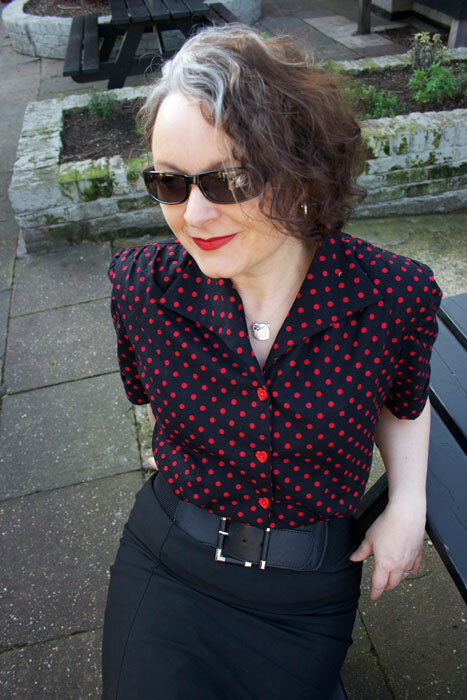 Such a stunner- you and the blouse that is!!!!! I love all the extra detailing!!! The heart shaped buttons are like the frosting on a cake!!! well done!!! 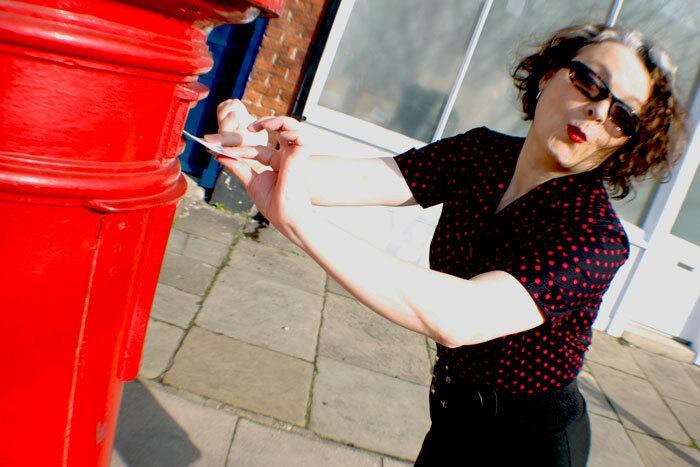 Pingback: The 1940s Shoe Dress | ooobop! Pingback: Me Made May 13: My second week | ooobop!